View from our friends’ deck. We all have that sense of going home when we revisit a place, either physically or in our daydreams, that strikes a chord in our soul. The greater Yellowstone ecosystem, of which Bozeman is a part, is reminiscent of home to us. So many memories swirled around me as we drove across Montana – the smell of rain on a warm summer day, pine needles wafting up from a trail crushed by our footsteps, the sight of billowy clouds hugging the limestone-crested mountaintops, the squawking of magpies as they hop across a golden meadow. Yep, we are having that déjà vu feeling of going home as we scan the 360º mountain range view and those big Montana skies. We spent two years in Yellowstone after escaping the corporate life and fell in love with the west in a much deeper, soul-healing way. The beauty and serenity of the wild surrounds us here, creating a perfect flow. This is our “true west”. Bozeman has been discovered since we last visited. It is tough to see land being chewed up by plot after plot of subdivisions, but it was bound to happen. 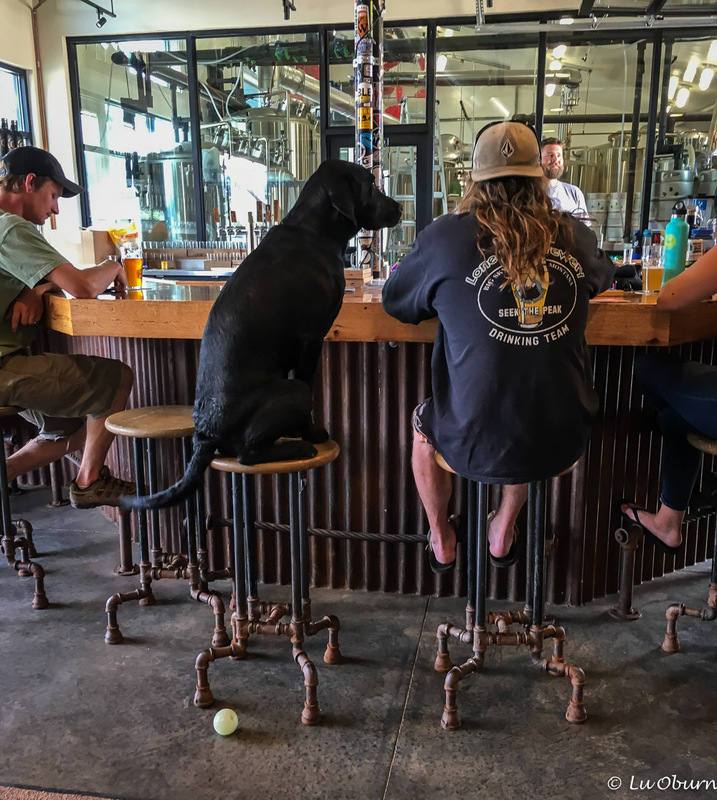 Bozeman now boasts 8 breweries, a great farmers’ market, a vibrant downtown lined with boutique shops, and is on the cusp of being a “foodie town”. Leaving the downtown area you are immediately enveloped in uninterrupted vistas. The breathtaking beauty of six mountain ranges that almost completely surround Bozeman beckon to outdoor enthusiasts year-round, and the many ranches dotting the landscape speak to the strong conservationist spirit here. 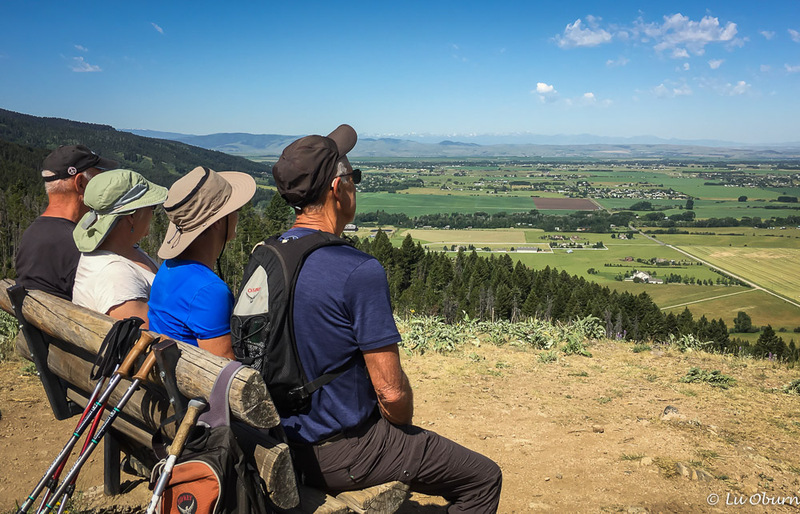 We’ve spent sunny days hiking in the Bridger Mountains, playing pickleball at the local tennis club, reconnecting with Yellowstone friends, enjoying great meals prepared by our friend Jim, and hop-scotching across the city taste-testing microbrews. This is a place that welcomes you, a place where you begin to wonder if you could lay down more permanent roots. It has been a perfect place to spend a couple of weeks, thanks to our gracious host and hostess Jim and Rosie. We can’t thank them enough for welcoming us into their beautiful home, filling our days and evenings with fun activities and lots of laughter, watching stunning sunsets and storm clouds build while relaxing on their deck. One final adventure before saying our goodbyes, and it was quite a send-off, was a magical day at the Montana Folk Festival in Butte. One of the Northwest’s largest free outdoor music festivals, the Montana Folk Festival featured multiple stages with 20+ continuous international musical performances throughout the day and into the evening. This festival rivals the national event we had been to several years earlier, also in Butte, and has continued for the past six years through the generous donations of its visitors and local sponsors. Wild man Jason D. Williams, playing rockabilly. He may have been the highlight of the day. Friends Jim, Karla, Rosie & Maria enjoying the show. Brisk crowds, even with the threat of heavy thunderstorms. Our trek north continues, as we make our way to Glacier National Park. So, where is it that home calls out to you? It sounds like a wonderful vacation! Only been to Bozeman once and it was fleeting. Lucky you to have such welcoming hosts!! So glad you returned to blogging and decided to share your excursion. Are you traveling with the 5th wheel? We’re enjoying our time in Idaho but my heart still calls Colorado ‘home’. Thanks Ingrid. It is good to be back to writing. We are not traveling with the 5th-wheel this time. Doing a car trip, staying with friends, in hotels, and even doing a little tent camping. We seem to be regressing. 😉 We decided not to get another travel vehicle until next year as we have the expense of a European trip this fall. I look forward to hearing more about your Idaho travels. We have not visited Bozeman yet but it sounds like my kind of place. I like Bend, OR a lot and it also seems like Bozeman. I think Bend and Bozeman are similar and the Bozeman area has so much hiking potential. We enjoyed our brief visit to Bozeman a couple of years ago just before visiting Yellowstone. It’s a lively town in a gorgeous location—as you so wonderfully described with your words and photos. Looks like you guys had a great time with your friends. We’ve been wanting to get back to Bozeman—we’ll try to plan it so that we can go to the music festival! You two would love the Folk Festival! We really liked Bozeman when we visited but it was only for a couple days. It’s on our list of places we want to return to. Sounds like you are having a good trip so far. What a breathtaking view from Jim and Rosie’s deck! There is lots to do in Bozeman so a return trip should be in the plans. The view from Jim & Rosie’s deck was of the Bridger Mountains, which is where we spent several days hiking. It’s easy to see why you love it there! Beautiful scenery, a funky little town, and a music festival. What fun! Yep, it’s a happenin’ place! You put an entirely different light on Bozeman. Gorgeous photos of the area. We did not get a chance to stop here only a drive through. Thanks for showing us the beauty of that area. It was a great festival but there is lots to do in Bozeman besides the music festival. This is an area of Montana that we need to visit and spend some time. Your friends certainly have a spectacular deck view:) A free folk music festival sounds perfect! 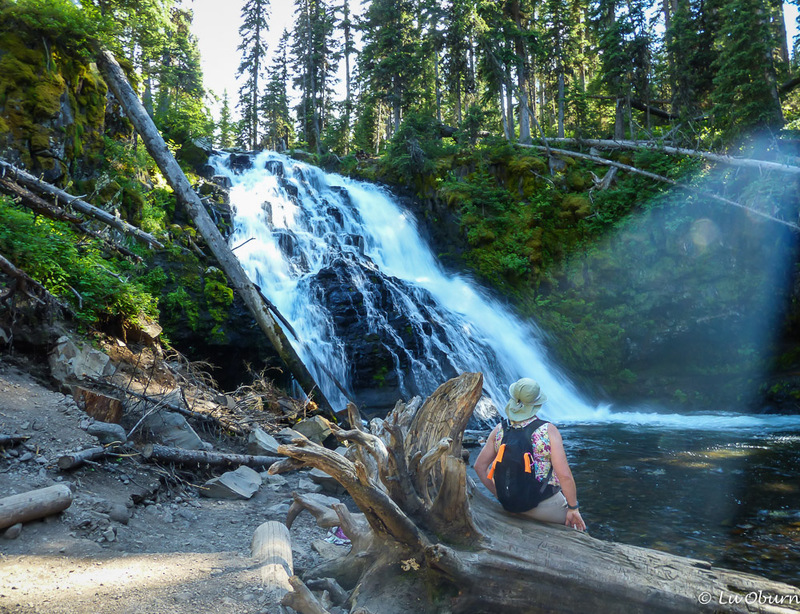 Good to see you got in some hiking to really enjoy the beauty:) I sure hope you are visiting the east side of Glacier! The hiking is amazing and the crowds aren’t there. Our favorite trails were the Grinnell Glacier and Iceberg Lake. Both are ten miles RT but not hard. The views and wildlife along the way keep you very busy, not to mention how spectacular the end viewing is:) Enjoy!! We got to Glacier last night to pouring rain. We are staying in east Glacier and both the Grinnell Glacier and Iceberg Lake hikes are on the list. Let the fun begin! 🙂 You should plan a trip to Bozeman someday Pam. The hiking is wonderful! We hiked to the Grinnell Glacier on a rainy day. It was our last day and I so wanted to see it since it won’t be around much longer. It was still wonderful:) We (I) decided to stop again on our way back from Canada because I didn’t get to do Iceberg Lake. So very glad we did this hike. Spectacular! We did Iceberg Lake and Ptarmigan Tunnel yesterday. Both were spectacular! We weren’t expecting any, given the warmer weather. But some were still there! I just drove through there last week on my way to Lewis and Clark Caverns SP. I’m at Little Bighorn Battlefield now and getting ready to head north, then home, only a few hundred miles away. It’s been two years since I was there. Enjoying your blog and photos…. Thanks so much. Safe travels. I am certain that Montana is a place I could easily adapt to living in. It is so utterly beautiful! Wonderful post! Oh Boy, we are missing on this one, for we are skipping Bozeman. Well your vacay there and captures is enough for me to see how beautiful it is there. Your friend have a pretty nice view. Love that pic of the dancing little girl,a photo moment and that sunset photo is tops. You will have to plan a trip to Bozeman someday MonaLiza. The hiking is fabulous! Thanks Sylvia! Montana has some of the most spectacular scenery! Are you now through with your remodeling on your FL home? It’s still ongoing, but the end is in sight. Probable a couple more months. Swooning over your photography! Welcome back! I have been to every state except Montana and Wyoming. Isn’t that sad–those exceptions? Your piece reminds me I need to go to those places. I want to start with Bozeman and Yellowstone. 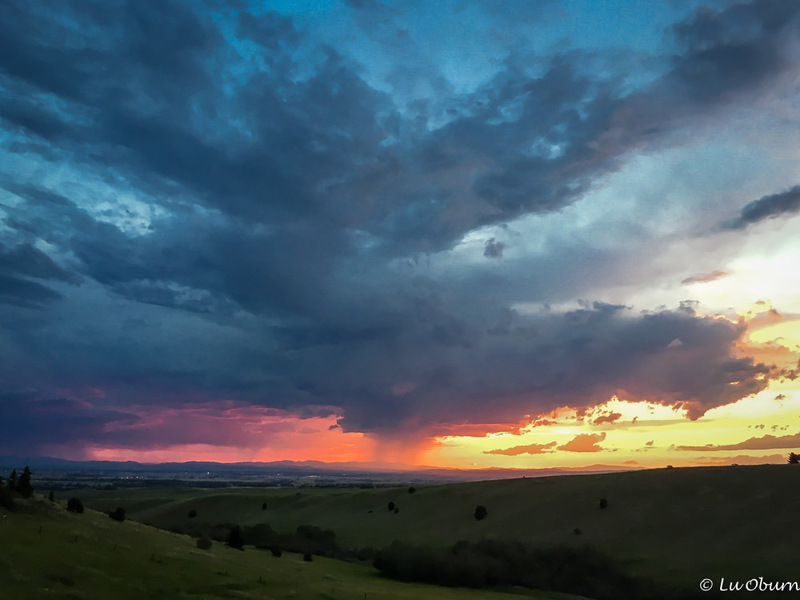 The beautiful photo of the storm approaching at sunset “calls” to me. Thanks! There are states we are still missing as well, but definitely, go to MT and WY. You will love them! I am so excited to have found your blog. Terry and I lived in Mexico for a year and have always dreamed of exploring/living in other countries. You are inspiring us!